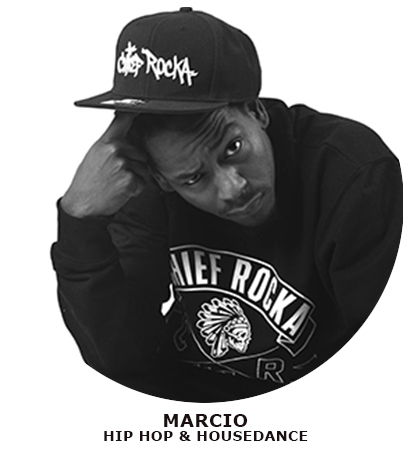 LAMARRE MICHAEL ALIAS " NIAKO " IS A MULTIDISCIPLINARY HIP-HOP DANCER. 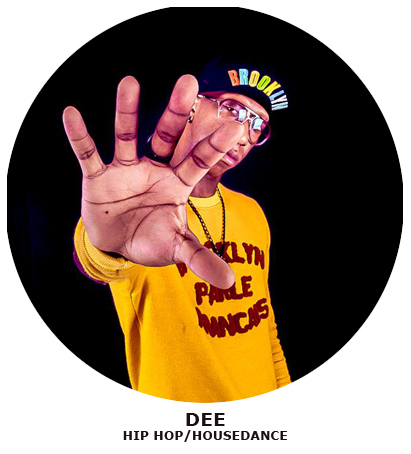 IN THE DALTONSPOSSE GROUP, HE HAS PERFECTED HIS EXPERIENCE WITH DANCING WITH MAJOR HIP-HOP PERSONALITIES SUCH AS: "LES RENCONTRES URBAINES DE LA VILLETTE” AND ”LE FESTIVAL DE SURESNES CITE DANSE ". HE HAS ALSO DANCED IN THE MUSICAL COMEDY " LES 10 COMMANDEMENTS ", WORKED WITH KAMEL OUALI AS WELL AS MANY CONTEMPORARY COMPANIES LIKE ARTOBA, PROPOS, AND ARTISTS SUCH AS MATT POKORA, BEATRIZ LUEGO ETC. 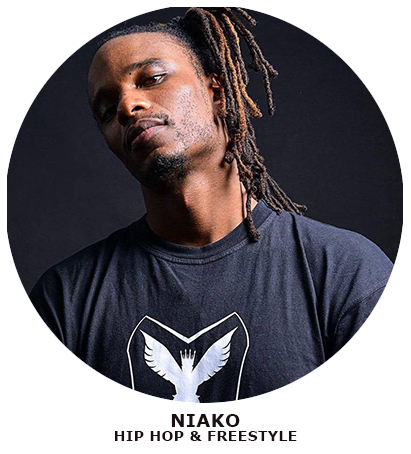 … TODAY, NIAKO IS A CHOREOGRAPHER, A DANCER, COMPATITION JURY (JUSTE DEBOUT) AND HE TEACHES DANCE THROUGHOUT THE WORLD. 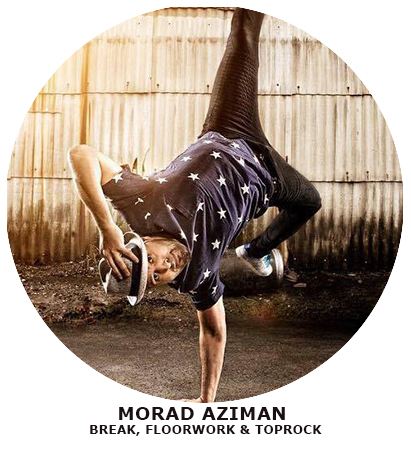 RECOGNIZED AS ONE OF THE BEST DANCERS IN FRANCE, HE WILL TEACH THIS YEAR AT FLOW DANCE ACADEMY PARIS. HIP-HOP AND HOUSE DANCER. HE FIRST WORKED WITH PHYSS IN BINOMIAL, CREATING A TRIBUTE TO THE BEATMAKER AND RAPPER J DILLA. HE HAS WON SEVERAL BATTLES WITH NIAKO BUT INDIVIDUALLY TOO (360 BMP FIRE, STADE DE FRANCE BATTLE, CONSTEST NIGHT, BRUSSELS BATTLES TOUR). AT HIS HEIGH, HE WAS PART OF THE "PRO PHENOMEN" COMPANY CHOREOGRAPHED BY YAMSON (YAMAN OKURI) AND PHYSS ( Philippe ALMEIDA). TODAY, DEE TEACHES HIS STYLE ACROSS EUROPE. 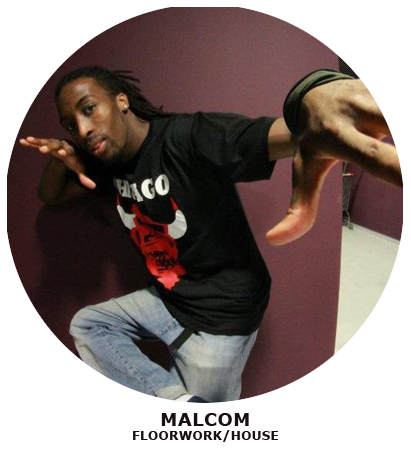 MALCOM, RENAMED NEO, IS A DANCER, CHOREOGRAPHER AND INTERPRETER FROM PICARDY. HE LEARNED TO DANCE THROUGH B-BOYING IN 2001. HE WAS INFLUENCED BY HIS OLDER BROTHER WHO IS ALSO A DANCER AND DJ. MALKOM QUICKCLY BECAME FRIENDS WITH THE CREW "SPECIMEN", WHICH, ALTER ON, WOULD BE KNOWN FOR THEIR VICTORIES AND INNOVATIVE SHOWS IN THEIR REGION. THEIR TENACITY AND COMPETITIVE SPIRIT PAID OFF. MALCOM IS THE DRIVING MOTOR WHEN WORKING WITH DOGGEDNESS AND HE IS INFLUENCED BY DANCERS SUCH AS REMIND, KAMEL, LUIGI ETC. HERE HE DISCOVERED A TASTE FOR EDUCATING. YEAR AFTER YEAR, HE BRINGS TOGETHER MORE AND MORE PEOPLE WHO ARE MOTIVATED BY HIS SKILLS AND CAPACITIES. HE EDUCATES AND PUSHES FOR MORE MOVEMENT RESEARCH. BY 2000, HE IS MOSTLY INTERESTED IN HIP-HOP AND HOUSE DANCE. IN 2008, USING HIS ORIGINALITY AND HIS INFLUENCE, HE IBROUGHT TOGETHER THE « SERIAL STEPPERZ » IMPOSING HIS OWN DANCE IDENTITY. 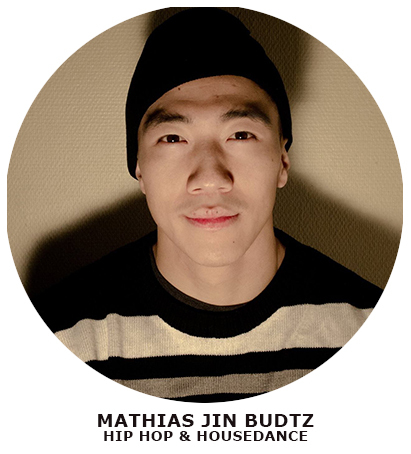 TODAY HE IS RECOGNIZED FOR HIS BATTLE VICTORIES IN ALL CATEGORIES INCLUDING JUSTE DEBOUT (2010 AND 2014), THE SUMMER DANCE FOREVER 2011 (AMSTERDAM), THE BUST A MOVE 2011 (MONTREAL), THE FUNKIN STYLEZ 2012 (BERLIN) OR THE GROUND FORCE SESSION 2013 (KOREA). TODAY MALKOM IS ALSO A PART OF AN MOVEMENT WITH HIS OWN NAME BRAND, THE « FLOORWORKS ». 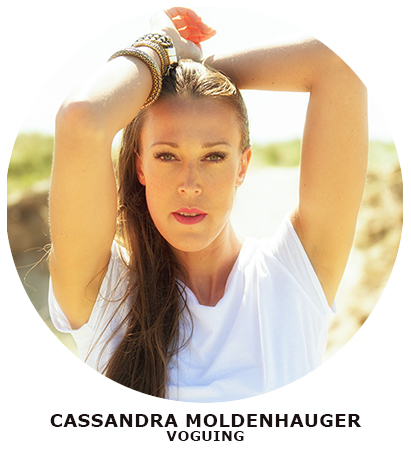 THE FLOORWORKS DEFINES THEMSELVES AS CREATORS OF MOVEMENTS BY TAMING THE GROUND. HE HAS DEVELOPED HIS STYLE BY FOCUSING ON HIS CREATIVE SIDE, BECAUSE FOR HIM , DANCE HAS NO LIMIT, AND IF SO; MAYBE THE IMAGINATION. 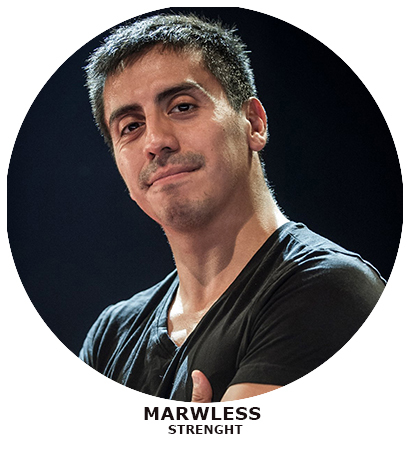 RECENTLY HE WAS CHOSEN TO BE A MEMBER OF THE "PHILIPPE ALMEIDA COMPANY" CREATED BY PHYSS. THIS YEAR THEY ARE PRESENTING HIS FIRST CREATION: " BOOTS " AND HAS DECIDED TO TRUST HIS INTERPRETATION QUALITIES ONE MORE TIME . IN THIS PERFORMANCE, YOU SEE A QUITE DIFFERENT PART OF HIM AND DISCOVER MORE OF HIS UNIVERSE. CLEARLY, THIS 30 YEARS OLD DANCER IS NOT EITHER AT THE BEGINNING OF HIS CAREER, OR AT THE END – HE STILL PROMISES US GREAT SURPRISES, PARTICULARLY WITH THE « FLOORWORKS » WHICH IS STILL GROWING INTERNATIONALLY. 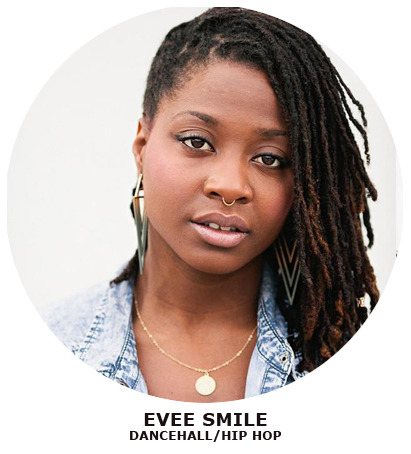 IN 2004 THIS HIP-HOP AND DANCEHALL DANCER TOOK HER DANCE EDUCATION AT THE MULTIDISCIPLINARY SCHOOL, WHERE SHE LEARNED THE FOUNDATIONS OF OLD SCHOOL AND NEW SCHOOL STYLE. 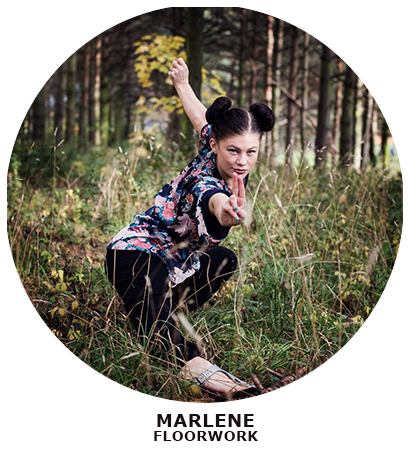 BEING VERSATILE, SHE EXPRESSES HERSELF THROUGH SALSA, SAMBA, WAACKING, VOGUING, DANCEHALL AND AFRICAN DANCE. 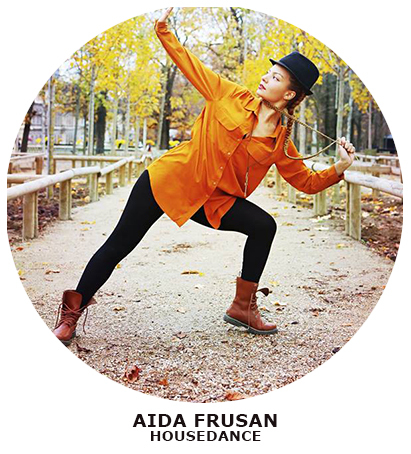 SHE HAS BUILT HER OWN EXPERIENCE THROUGH VARIOUS COLLABORATIONS WITH ARTISTS AND CHOREOGRAPHERS, IN THEATER COMPANIES (TVD " NO DISTRICT ", ENEADE "CHAOS") AND VIDEO CLIPS. SHE HAS COLLABORATED WITH SEVERAL ARTISTS DURING ADMIRAL T OR EVEN LORD KOSSITY TOURS… PASSIONATE ABOUT THE HIP-HOP FREESTYLE, SHE USES IT AS HER PRIMARY WAY OF EXPRESSION. TODAY AS CO-DIRECTOR OF FLOW DANCE ACADEMY, YVES-LINE alias "EVEE SMILE" TEACHES, JUDGES AND CHOREOGRAPHS MANY SHOWS IN FRANCE AND ABROAD. 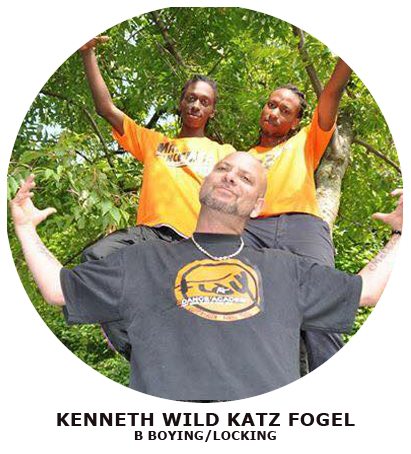 A member of Zulu Nation, Kenneth is one of the most famous b-boys in Denmark. 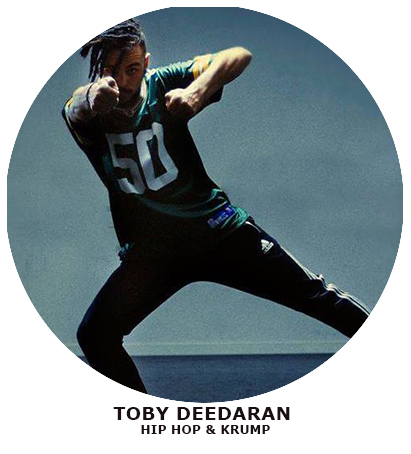 Having danced in "Out of Control", it's in the 80s that he and a couple of fellow dancers created and helped develop the breakdance and hip-hop culture in Europe. "Out of Control" is recognized in the underground as well as in the commercial world. The dancers produced high quality shows ( doing poppin, lockin, new jack and break) throughout Europe and in The States. Out of Control is the only Scandinavian crew that has won a third place in the biggest battle of the world: "Battle of the Year" in 1995. The group has traveled all over the world with street shows and danced for artists such as Grand Master Flash, Afrika Bambaataa, Krs1, The Fugees, Redman, Das EFX, A Tribe Called Quest etc. Since 2001, Kenneth has had his own school called Flow Dance Academy and here passes on his knowledge about hiphop to the new generations.